Choice Hotels - now available through your iPhone. Use this free iPhone App to quickly find and book more than 5,800 Choice Hotels properties anytime, anywhere. 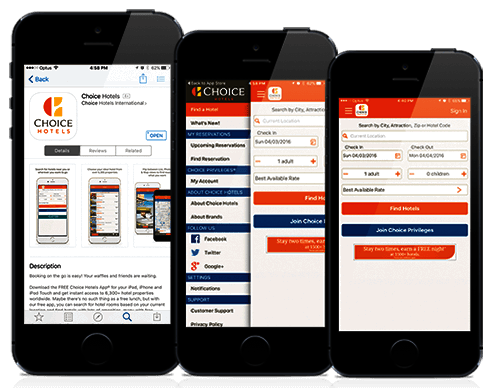 The free Choice Hotels iPhone App allows you to easily search for hotels near you, in any city, by address, airport or by popular attractions, all from your iPhone. Select from any Choice brand: Comfort Inn, Comfort Suites, Quality Inn, Sleep Inn, Clarion, Cambria Suites, MainStay Suites, Suburban Extended Stay, Econo Lodge and Rodeway Inn, as well as Ascend Collection hotels. Wirelessly download the application directly to your iPhone to find and book hotels instantly. The Version 3.42.0 Choice Hotels iPhone App features cutting edge GPS technology to help you find the nearest Choice Hotels properties, search for hotels in specific locations, and make real-time bookings.